With so many attractions beckoning us in and around Albuquerque, we can hardly decide where to visit next. 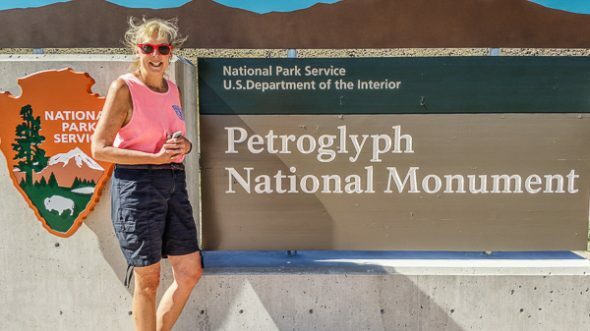 Because we want to see as many National Parks as we can this year, we select the Petroglyph National Monument for an afternoon foray. We are surprised to learn that there are no Petroglyphs at the National Monument Visitor Center. Instead the rangers there provide us with a map and driving instructions to the 3 nearby sites. We choose the site that appears closest to our RV and when we arrive at the parking lot learn that the trail is practically in people’s backyards and is right behind an automotive express oil change franchise. Although this is the most oddly located National Monument we have visited so far, we still ranked it pretty highly because it is the only park that we know of where there is a Sonic Drive In directly across the street from the trail. After a brutal, scorching walk of almost 200 yards, we are able to revive ourselves with happy hour drinks and ice cream for a total cost of $6 at the Sonic. As you can tell from the video, I can’t pronounce it right half the time either. I agree that they mostly just look like rocks with ancient doodling. Since no one knows what they mean, I never know what to make of them. For the rest of our visit here, I plan to stick to photographing colorful balloons. Those – I understand! Miss you – keep up the good work at home!